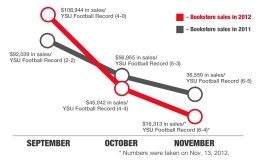 After the Youngstown State University football team won four consecutive games in September, the YSU Bookstore saw a dramatic spike in clothing and merchandise sales that was nearly $17,000 higher than sales in September 2011, when the Penguins broke even with a 2-2 record. Clothing and merchandise sales from September totaled $108,944.08, compared to $92,039.80 in September 2011. Eva Gucwa, coordinator of merchandising for the YSU Bookstore, said the Penguins’ victories are only part of the reason for the sales increase. “The major factor for the increase is the number of home games in September this year against last year,” Gucwa said. In September, YSU played three games at Stambaugh Stadium; in September 2011, the Penguins played there just twice. Novotny credits the win at Heinz Field against the University of Pittsburgh on Sept. 1 for kicking off merchandise sales. “With that victory, you not only had people getting excited about the team, but people who traveled and wanted to have their red logo apparel to represent [YSU],” Novotny said. Trevor Parks, sports information director, said the football team should not be the only team getting credit for the sports craze on campus early in the fall semester. Though sales often decrease dramatically in the middle of the semester until the Christmas season gives them a boost, this year, sales plummeted particularly sharply in October and November. October’s sales were approximately $10,000 less than those in October 2011. In an effort to increase sales, the Bookstore is distributing a coupon for discounts on logo apparel; it will be valid through the end of the fall semester.